There was a time, before computers, when every child in senior school carried with them a plastic stencil for creating neat flowcharts. Thankfully, creating them on a computer is so much easier to do, faster to change, and infinitely reproducible. Clear diagrams can detail the flow of information, products on a production line, the execution of code in software, and a dozen other business-critical processes. Here are 10 of the best we could find, each with their own twist on the perfect recipe for being well understood. Business users often don’t work in isolation, and Cacoo by Nulab is a charting solution built to address that need, among others. It’s an online tool that interfaces to a wide range of cloud services, including Google Drive/Docs, Confluence, Adobe Creative Cloud, Box and Dropbox. In addition to Cloud stored and distributed content, Cacoo also works with TypeTalk (another Nulab product) and Slack to enable an information flow that alerts other team members when a diagram is updated. The number of templates might be less than other products, but it has all the critical ones like Network diagrams, organisational charts and floor plans. Pricing is competitive, starting at $5 per month per user for a team of three people, when paid annually. Other pricing options are available for larger team groups if you contact Nulab directly. There are also educational plans for teachers and students. There are also educational plans for teachers and students. For those wishing to check out Cacoo, trials are available for 14 days, and there is a free plan that allows six diagrams to be created in it, with limited sharing options. The ConceptDraw Office package combines three different products in a single suite of applications designed to enable business planning and enhance productivity. This includes dedicated software platforms to cover diagrams, mind-mapping, and project management. The ConceptDraw Diagram product is a highly versatile business graphics and diagramming product with thousands of stencils and hundreds of templates ready to use. But for those that want greater flexibility, it is possible to design any stencil elements from scratch and incorporate them into a design. These custom elements can then use the tree and chain connecting modes available in the ConceptDraw Office software. Fully compatible with Visio (stencils and drawings), ConceptDraw Diagram can be installed either to the Microsoft Windows or Apple Mac platforms, each costing $199 for a single license. However, if you want to buy into the while ConceptDraw Office package a license will cost you $499, which discounts all three main products (Diagram, Mind Mapping, and Project). Five and ten user license packs are available with a user discount, and there are also discounts for teachers and students. A free trial is available for those wishing to try it out. Where other tools rely on application installations, Creately is available online, as a desktop app and also on mobile platforms. It’s not exclusively for Flowcharts either, as it can be used to produce a wide variety of diagrams including organisational charts and wireframes, Gantt charts, Infographics and even maps. The available templates are extensive, and you can try it out online before you invest. Online Creately costs just $5 per month or $49 per year for a single user, and cheaper-per-head team pricing is also available. The Creately Desktop is $75 with one year of updates included. Let’s say it upfront: Draw.io is free. No, seriously. They develop and maintain it at no cost to the user. When you’ve recovered from that shock, you should know that it’s an online solution that can save your work to Google Drive or Microsoft OneDrive. It can handle a wide range of schematics, including complex BPMN workflows, UML diagrams and general Flowcharts, along with mind maps and network infrastructures. The list of possibilities is so big that we chose not to list them all here. So what is the catch? Well, if you use either Confluence or JIRA Cloud, then they’d like a subscription paid for that functionality. But it’s hardly expensive, being just 1$ per user per year. Before you spend money on other solutions, it’s worth checking out Draw.io, if only to be amazed at what software tools you can get for free, and how good they can be. Based in Arizona, Pacestar Software has four diagram design tools of which Edge Diagrammer is the most versatile. Using Edge Diagrammer, you can easily generate block diagrams, flowcharts, org charts, family trees, data flow diagrams and many other standard diagrammatic forms. In addition to the base functionality, Pacestar has some free extension packs that support an even wider range of different diagramming methodologies. The limitations of this product are that it is exclusively Windows platform, although it has very minimal hardware requirements and will run on any full version of Windows from XP upwards. There is also a free to distribute Windows tool that allows anyone to view drawings created using Edge Diagrammer. While this software is undoubtedly powerful and effective, it doesn’t take account of information flow or distribution within a large operation. Therefore if you intend to use this you’ll need to manage the files it creates with other tools. A single user license is $149, and the more seats you purchase, the cheaper it gets per user. For those wanting to try it out a thirty-day trial is available to download, and for that period you can experience full functionality. Another cross-platform option, Edraw Max, works on Windows, Mac and Linux natively. Created by the Shenzen Edraw software company, Edraw Max was built to construct professional-looking flowcharts, organisational diagrams and has templates for 280 different diagram types. If you have a specific need, you might not need all the power of Edraw Max, and the same company makes tailored tools for Mind Mapping, Infographics, Org Charts and nine other different specific diagram requirements. In theory, Edraw Max can do any of these jobs, although users might find the scope and power of this tool a little daunting at first. Those that get through an initially challenging learning curve report that once mastered this is a great application for creating professional looking schematics rapidly and efficiently. A single user license is $179 and includes free upgrades for three years on Windows and Mac. Pay a little more and you can get a lifetime license with indefinite upgrades, or you can pay $99 per year for a subscription. Multi-user discounts are also available, as they are for educational users. This product has many parallels with Draw.io, in that it also supports Confluence and JIRA Cloud, but Gliffy is also working on a proprietary Cloud solution to be launched soon, called Gliffy Project. Gliffy Diagram is available now and provides a straightforward tool for creating a very wide variety of chart types online or within Confluence. It also stores created charts into Google Drive, should you use that those Cloud services. Pricing is $7.99 per month for a single user, but this unit cost reduces to $4.99 per user for team members. Multi-user licenses also include additional groupware functionality. For Enterprise customers pricing is less per-person structured, and Gliffy provides an integrated solution that can dovetail into existing business processes. One nice twist on this online software tool is that you can install a Chrome version that can work offline, should an Internet connection not be available. What this product lacks is much in the way of object customisation, although it scores highly on ease of use and a gentle learning curve. According to Lucid Software, they have over 11 million users. Strongly suggesting that this is not a niche solution, but a highly popular one. Lucid is one of the few tools that covers Microsoft Windows, Apple Mac OSX and various Linux distributions by default, admittedly by being an online app rather than natively. For those who need workflow integration, Lucidchart supports Confluence, JIRA and JIVE, along with the Google Cloud and apps and Microsoft Visio compatibility. There is a free trial that isn’t time limited. Instead, diagrams are restricted to a maximum of 60 objects, sufficient to explore its potential. Licensing starts at $4.95 per month for a Home user, and ‘Pro’ Business users pay $9.95 per month, both paid on annual subscriptions. Pro users get the ability to import and export to Visio, and dynamically link data into their charts for the extra money. There are also Team versions with groupware and Enterprise options, all at extra cost. Lucid convinced Amazon, Adobe, DocuSign, Cisco, Red Hat and Wells Fargo to be customers. And, it might be right for your business, too. 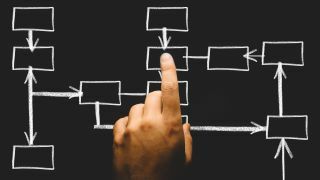 When most people think about flow charts, they almost immediately think of Visio, although the product is capable of creating all manner of diagrams quickly and efficiently. The obvious big selling point of Visio is that its part of the Office 365 suite, and therefore designed to integrate with the other Office tools seamlessly. Microsoft offers four different options with Visio; two online, and another two that are standalone Windows applications. Visio Standard 2016 and Professional 2016 are the installable apps, and they retail for $375 and $709 respectively. As you might guess, that high pricing is intended to encourage you to subscribe to the online versions, labelled Visio Plan 1 and Visio Plan 2. Plan 1 is pitched at $5 per user/month and is purely an online version, where Plan 2 costs $15 per user/month. And with that you also get online and Visio 2016 Professional app, and access to better mobile tools, and a Visio Viewer for iOS. These prices are if you subscribe annually, with month-by-month pricing being a little higher. For those already using Office 365, many of the existing packages include the online version of Visio. And, you can try that for free on Microsoft’s Office online website. Like Lucid, SmartDraw can name an impressive list of blue-chip companies that are license holders since the company started in 1994. These include at least half of the Fortune 500 quoted businesses and more than 250,000 public and private enterprises across the globe. The SmartDraw product can be used online or as a standalone Windows application. It supports the creation of no less than seventy chart types, including all the standard ones. There more exotic templates include those for documenting a crime scene, landscape gardening, seating plan and even accident reconstruction. For those working as part of a team, it supports Confluence, JIRA, Trello and Google’s GSuite. And, it’s fully compatible with Visio, able to import and export diagrams and stencils with Microsoft’s application. The Windows Desktop offers a single user license for $297 and multi-user 5+ licenses from $595. The online version is just $9.95 per month for one user, and $5.95 per user/month for 5+, both billed annually. The multi-user packages have extra functionality that allows licenses to be managed and can also control the sharing of SmartDraw data with other users. Most of the sophistication of SmartDraw is in the templates and not the application. Therefore it might be more suitable for those who make many simple charts, and not those involved in the creation of very complex diagrams. Although designers might use these tools, the majority of people creating flowcharts aren’t classically trained graphic designers. Therefore, they need a tool that assumes no artistic abilities but can generate professional looking results rapidly. The way that most software handles this delicate balance is to offer the user templates that avoid them using too many fonts, or trying to cram too many elements into a design. If the operator has graphical skills, these restrictions might seem a hindrance, but to the less confident, they can be exactly the structural support these folks need. Templates: How many does the application have, and are any of them tailored to your specific needs (coding, game logic, command structures, etc)? Objects: Almost all software will have a selection of predefined objects, and the number and quality of these should be assessed. If the graphical elements that you specifically need aren’t in the library, the ability to define your own will be very important. Groupware: As important as the creation of a diagram might be, getting it distributed and centrally updated is also critical. Some applications can enable multiple people to work on the same design, which might be useful when documenting an especially complicated process. Trial: Some of these tools can be expensive or require ongoing licensing, so it is useful to test a trial version before investing company cash.